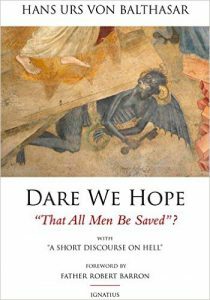 In this book Roman Catholic theologian Hans Urs von Balthasar defended what is sometimes called hopeful universalism, i.e. the belief that Christian orthodoxy allows us to hope that all persons will eventually be saved. Balthasar does not teach universal restoration as a dogmatic necessity, but defends what may be termed a conditional, but hopeful universalism: It is at least possible that all human beings will eventually accept the salvation of Christ. Julie Ferwerda: Raising Hell – Christianity’s most controversial doctrine put under fire! "My dear brothers and sisters, did you hear it? *Death—but life! * When in these days we wish each other 'Good Easter' or 'Happy Easter', we will want to remember that a great deal is at stake: death—but life. ... Let us underline the 'but'! Death and life are not just two words, concepts, or ideas. They describe a journey, a history embodied in our Lord Jesus Christ on Easter morning when he rose from the dead. Then and there, in him, it was accomplished once for all, but then and there also for us. Hence his Easter story is our history as well. *Death—but life, eternal life! * This is why 'we know that we have passed out of death into life'. ... With Christ's resurrection from the dead God's free gift, eternal life, entered the world. He, the dear son, he, the faithful and obedience servant, he who was willing to make our sin his own and to die our death in replacement of us, he, Jesus Christ, was raised from the dead and recalled from the tomb by the Father. He was robed in eternal life. But now remember also, dear brothers and sisters, that God so acted in Jesus Christ in order that we, truly all of us, without exception, may share in this free gift of life eternal. *His* story now becomes *ours*, just as before *ours* became *his*. This was accomplished when the Easter story reached its climax. This was the great 'but' and 'onward' whereby our sin and with it our death was relegated to the past. This was and this is the light mentioned already in the story of creation. 'God said, *Let there by light! * and there was light.' There was light for us all in the story of Easter, in the event of Jesus Christ. There all of us, mankind itself, were made free for eternal life. The Lord is risen! He is risen indeed! In him and with him we, too, are risen indeed."